The Next Few Pages Will Take You Through Some of the Steps We Take in Creating a typical "Commercial" Grade Roof Truss Project. This particular Job is a Dental Clinic in Moore, Oklahoma. 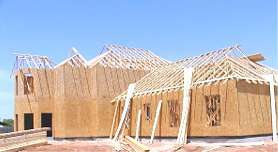 It has approximately 50 Different Truss Types, and 310 Total Roof Trusses. Designing these Trusses is Made Easier using Our S.O.D.A. Engineering programs.